With her husband, TV charlatan Jim Bakker, Tammy Faye Bakker led the Praise the Lord Network (PTL). He was the first host of The 700 Club, and years later they co-hosted The PTL Club, where Tammy Faye became infamous for her smarmy, teary-eyed singing style, and especially for her troweling use of mascara. At their ministry's peak, PTL became the first Christian organization to launch its own satellite, facilitating worldwide outreach 24 hours daily. The Bakkers' income as professional Christians allowed them to own several lavish homes, and PTL even built a Christian theme park, before their ministry collapsed in scandal. As investigators closed in, the Bakkers signed their ministry over to Jerry Falwell, and Jim Bakker was convicted of fraud and sent to prison. While he was incarcerated, Tammy Faye divorced him. She later married Christian construction magnate Roe Messner, who made his fortune building churches. Messner was the lead contractor for the Bakkers' theme park, Heritage USA, and his involvement in that project got Messner, like Tammy Faye's first husband, convicted of fraud. 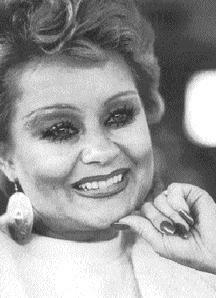 She was profiled in a 1999 documentary, The Eyes of Tammy Faye, which, along with a subsequent appearance on The Surreal Life, significantly softened her public image. In her latter years she was generally viewed more as a sweet, ditzy nut than as a charlatan. To the end, she wore layers and layers of make-up, but she also seemed utterly sincere as she proclaimed her faith, even as she was dying of cancer. She was also known for her friendliness and openness with gays, and while she always maintained that homosexuality is a sin, she would add with a smile that it is "no worse than any other sin". She also kidded her own odd image by judging Tammy Faye lookalike contests, wherein everyone wore way too much make-up. Her autobiography is optimistically titled, I Will Survive... And You Will, Too. She died just days after shocking many people with her emaciated physical appearance on The Larry King Show, where she said, "I believe when I leave this earth, I'm going straight to heaven."